Although it truly feels like our school year just began, reality dictates that in less than a month our students will be back at home for the winter holidays, sharing stories about their time in New Zealand with their family and friends. The best stories culminate from amazing experiences, though, and this week is devoted to giving our students experiences that they’ll want to share again and again. With that in mind, we’ve ventured down to New Zealand’s South Island for a week’s worth of outdoor activities, place-based learning, and team-building exercises. Half of our students have chosen to spend the week kayaking and camping at Abel Tasman National Park while the other half have elected to undertake a series of adventures in the forests and rivers surrounding Christchurch. Here’s a look at each trip’s itinerary. Abel Tasman might be New Zealand’s smallest national park, but its golden beaches and aquamarine coastal waters have developed an enormous reputation among locals and visitors alike. 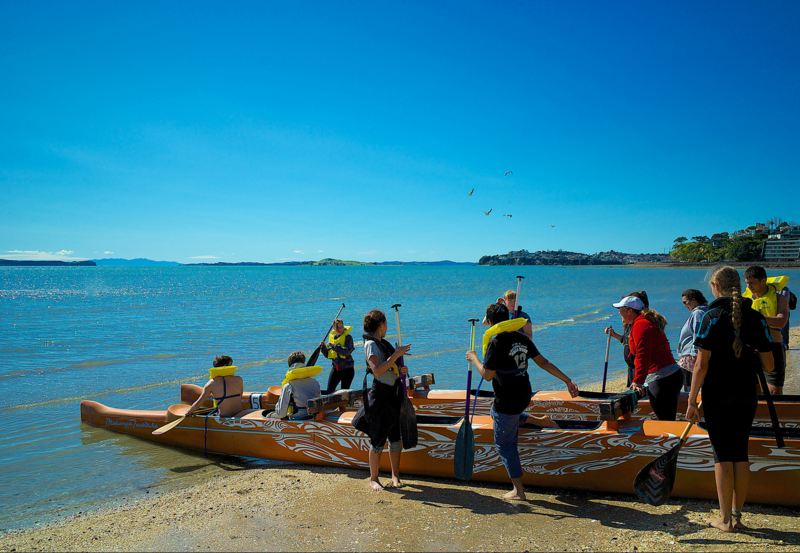 It’s on these beaches and waterways that half of our students will call home for five days, using their feet and kayaks as the only modes of transportation — much like the Māori have for centuries. Accompanied by two staff members and an experienced guide, our students are navigating their way down the coast from Wainui Bay to Marahau, taking time to explore the flora, fauna, and wildlife of the surrounding bays and coves, but most importantly reveling in one another’s company. At night, ghost stories, smores, and the crackle of campfires are replacing their usual creature comforts as the coral beaches become their campgrounds. As the five days wrap up, they’ll no doubt all be well-tanned, well-toned and in good spirits — just in time for exams! Smartphones, laptops, and iPads are all integral to our learning experience, but sometimes it’s best to just switch them off and live in the moment. Our time on the South Island is centered around this philosophy, so our stream of Instagram photos featuring the #tgslife tag won’t be in use (but keep an eye on it for good measure). Would you like to be kayaking in New Zealand’s South Island? We are currently accepting 10th and 11th grade students for the 2015-16 school year. While you won’t actually get to kayak in New Zealand, we’ve got plenty of other adventures lined up for our terms in Sweden, Bosnia and Herzegovina, and Italy. You can learn more on our admissions page or by submitting an inquiry. We look to hearing from you!